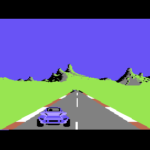 Already there exists a TV game of the old classic TV series, but Domark decided to upgrade the old franchise on the C64 and soop up the aging Macmillan version which was already done. We don’t know exactly how far things would have been enhanced, but Domark did say that Anneka Rice would not feature in the game. Apart from this we know no more – was this ever even started?… Or did they just stick to releasing the age old version which was done years before? We are not sure – we need confirmation. Can you help?